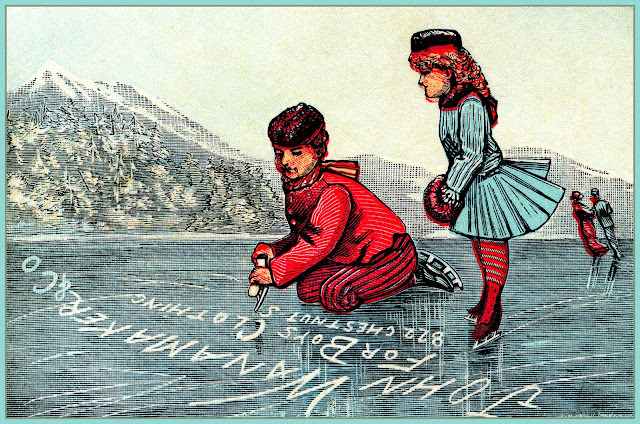 Based on articles in Wikipedia, the 822 Chestnut St. Philadelphia PA address carved into the ice above was probably one of several Wanamaker's locations before the business consolidated at a new location in 1910. Wanamaker's in 1876. This may have once been a railroad depot. Meanwhile, near if not on the site where Wanamaker's began, another famous (for awhile) business started up. To those accustomed to mall stores with sprawling aisles on a single floor, the multi-story department store seems old-fashioned and just a little inconvenient. Going all the way up to the 9th floor of a store for the children's department would be thought a major inconvenience today. In fact, most 21st century shoppers make online virtual world purchases without ever seeing or experiencing the ambience of any real world store as a destination. In the late 19th century, grand entrances of competing merchants beckoned customers to visit for unique buying experiences. Wanamaker's was both unique and innovative. It was the first store in Philadelphia to be electrified. It was the place where the price tag was invented. It was and thankfully still is the location of the world's largest organ. Thanks to Google Street View and YouTube, it's easy to share with you the unique atmosphere of this extraordinary facility. cameras pass by below in May 2014.
http://www.operaphila.org -- On Saturday, October 30, 2010, the Opera Company of Philadelphia brought together over 650 choristers from 28 participating organizations to perform one of the Knight Foundation's "Random Acts of Culture" at Macy's in Center City Philadelphia. Accompanied by the Wanamaker Organ - the world's largest pipe organ - the OCP Chorus and throngs of singers from the community infiltrated the store as shoppers, and burst into a pop-up rendition of the Hallelujah Chorus from Handel's "Messiah" at 12 noon, to the delight of surprised shoppers. This event is one of 1,000 "Random Acts of Culture" to be funded by the John S. and James L. Knight Foundation over the next three years. The initiative transports the classical arts out of the concert halls and opera houses and into our communities to enrich our everyday lives. To learn more about this program and view more events, visit http://www.randomactsofculture.org. The Opera Company thanks Macy's and the Friends of the Wanamaker Organ (http://www.wanamakerorgan.com) for their partnership, as well as Organ Music Director Peter Conte and Fred Haas, accompanists; OCP Chorus Master Elizabeth Braden, conductor; and Sound Engineer James R. Stemke. For a complete list of participating choirs and more information, visit http://www.operaphila.org/RAC. This event was planned to coincide with the first day of National Opera Week.